Silver Breeze Flag Line - Welcome to CAU Bands! 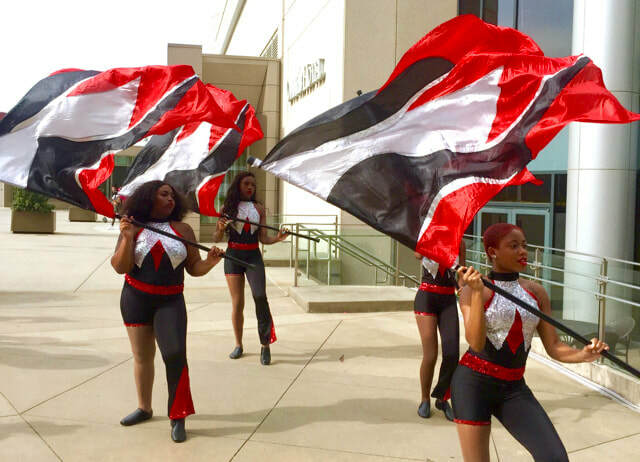 The Silver Breeze Flag Line provides color and visual entertainment and flair within the Clark Atlanta University Mighty Marching Panthers Band. The Flag Line performs with the band at football games, parades, exhibitions, selected University programs, and other band appearances. Click here for video audition information. Report outside the Band Room, 3rd door to the right upon entering the Stadium. ​for lost/stolen items, or immobilized, booted, damaged, or towed vehicles. A brief interview will be conducted to get to know you better. You will be evaluated on the fundamental movements of flag/color guard. Movements include, but are not limited to drop spins, figure eights, butterflies, single/double spins, and simple tosses. A workshop will be conducted to teach marching, strutting, two stand routines and a short flag routine. These elements will be combined to create part of your final evaluation performance. You will perform the routine taught to you during the Silver Breeze workshop and a routine you've pre-prepared. You should plan to arrive 15 minutes EARLY to allow time for your personal preparation and getting settled. Registration will begin promptly at 9:00am. Arrive in your interview attire. You will change into your workshop attire after your interview. You will change into your audition attire after the workshop. This is a separate change of clothes IN ADDITION TO your workshop attire. Be prepared to showcase an independently created solo performance. If you have additional questions regarding Silver Breeze, forward them to silverbreezecau@gmail.com.